Location: Prominently sited public building in the centre of the town. History: The site has been in long-use for a public building: there was a guildhall here by at least 1629, and when a market building (which had stood in the centre of Broad Street to the E of this site) was demolished as unsafe in 1761, the general, corn and flannel markets were re-housed in the guildhall buildings. A new town hall accommodating all these functions was built between 1795 and 1804, by Simpson and Hazeldine of Shrewsbury, and it was extended by the erection of a Butter Cross (on the N side of the site) in 1815. In 1874, a new building was commissioned, designed by Benjamin Lay, architect, of Welshpool. The new building probably incorporated some of the fabric of its predecessors (notably in the market hall to the rear), and it was itself enlarged in 1881. Exterior: Mixed classical style with French Renaissance influences. The ashlar facade has an asymmetrical composition (taking account of the sloping site and expressing the various uses of the building) and is dominated by the advanced 4-storey clock-tower to the centre over the entrance. Segmentally arched main entrance in panelled architrave with bracketed lamp, heraldic emblem to keystone and recessed panelled doors with tall fanlight. First floor sash window onto balcony has segmental pediment with paired brackets and pilasters. Balcony has balustraded parapet and is carried on strong moulded brackets: its base is a continuation of the cornice band over the ground floor in the left hand section. Paired sash windows over a moulded cornice above the balcony window; the upper stage of the tower is emphasised by angle pilasters with foliate capitals defining the upper stages, and there are clock faces to each elevation, above a panelled apron over a geometric punched band course. Disc ornamented entablature. The tower is surmounted by a French-style pyramidal stone roof with lucarnes, iron-work brattishing and weathervane. To the left of the central tower the facade is 2 storeyed with bold classical detailing, while to the right it is 3 storeyed with simpler detail. 3-bay left hand range, articulated at first floor by acanthus capitalled pilasters, with a pediment over the wider central bay above the strongly moulded cornice. High panelled blocking course. Round-headed windows with stencilled key blocks; the central window is of late Renaissance two-light type with oculus; paired pilasters to end. Deep cornice to ground floor, articulated as 4 bays by plainer pilasters, channelled towards the base; tall windows and half-glazed entrance to left. The ground floor in the right hand half of the building balances this exactly (though with renewed glazing), while above the cornice, the elevation is divided into two bays by foliated giant order pilasters uniting the first and second floors; the first floor also has intermediate pilasters forming a band of 4 windows retaining their sashes. Shorter second floor windows have modern glazing. Cornice over second floor continues that over the first floor of the tower. Hall Street Elevation: 3-storeyed, 4-window return of the main entrance range, with similar parapet, cornice and pilaster treatment, and shallow second floor windows over first floor sashes. The ground floor cornice also returns over tall semicircular headed openings with moulded arches and keystones; the outer openings are doorways, one to the middle retains small-paned glazing and the other is blocked. The 3 bays beyond to the NE may represent the remodelling, rather than the replacement of the earlier C19 market: Red brick and 2-storeyed, with deep modillion bracketed cornice and full-height pilasters; similar round-arched openings with stone hoods to first floor and gauged brick voussoirs to ground floor with stone impost bands and sills. Rubble plinth, with grilled basement lights to right. The return elevation to the rear retains a similar round-headed small-pane window beneath 2 blocked windows with finely gauged brick heads. The market was enlarged in 1881 by the addition of the transverse hall to the NE with full-length louvred clerestory. The classical broken-pedimented S front has finely detailed brickwork including dentilled bands to the top over the central ocular windows, and also to the 2 tall recessed within which are set the semicircular arched good entrances; modern doors. Central round-headed window to opposite end. The long side elevation has an inserted sandstone plaque dated 1877. Interior: Minton tiled entrance and stair hall. Cantilevered stone dog-leg staircase with open-work cast-iron balustrades with floral ornamentation. Principle public rooms to first floor, with Court-Room in left hand range retaining some original fittings including many of the benches and the dock, which has ornamented cast iron railings above the panelled wood-work. Council chamber in right hand section retains fittings of early C20 date. Assembly hall in rear range has ribbed coffered ceiling. Ground floor houses former corn-exchange in left hand range, with main market hall to rear. The interior of the market hall retains stone flagged floor, and there are stone Doric columns probably remaining from the earlier market building, now carrying I-section cast-iron beam. 2 cast-iron columns with simply foliated capitals also remain, but the other supports are later replacements. 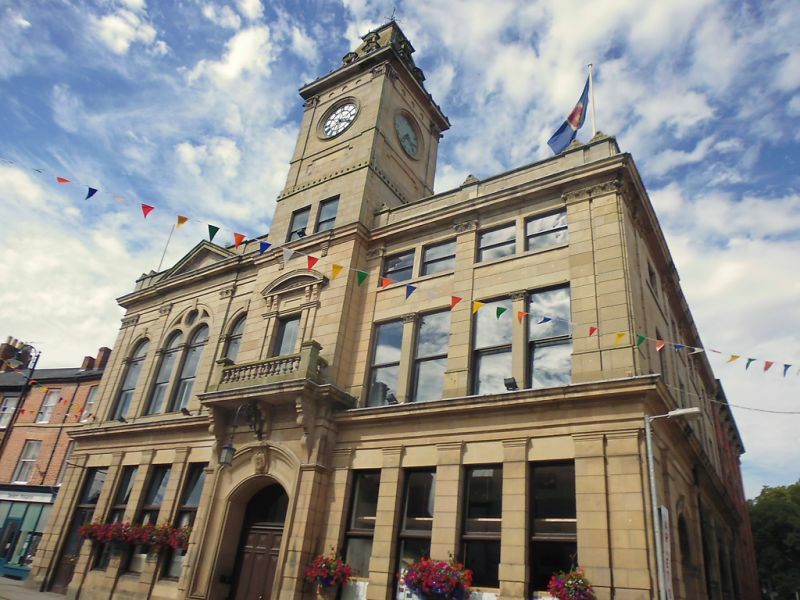 Listed as a largely unaltered Victorian Town Hall and Market that makes an important contribution to the townscape. Towards the top of the street, near its junction with Broad Street.